After the announcement of the Windows 10 and Xbox Cross-Play feature at the Windows 10 consumer preview event earlier this year, one could assume that Tom Clancy’s The Division will also make use of this cross-play functionality. The answer is “no”! A lot of people are still asking questions about it and while only a few titles like Fable Legends have been officially confirmed for offering this multiplayer experience, The Division won’t allow any sort of cross-platform gaming interaction between the three platforms PC, Xbox One and PS4. Although this short but precise answer is almost 1 year old and also refers to the already canceled Companion App, we have found two other, more recent conversations. 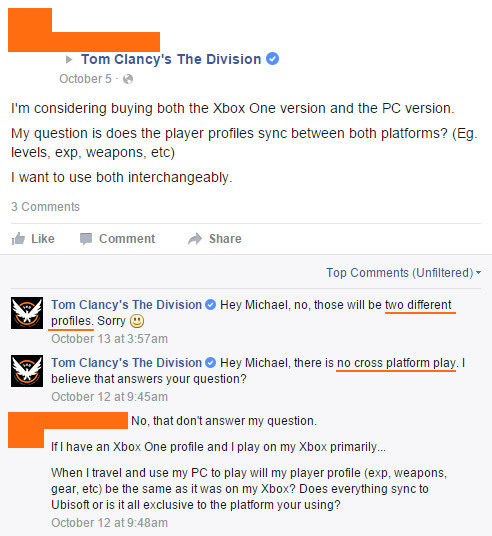 The first one is from October 2015 between the game’s official Facebook page and a fan who wants to know, whether cross-platform gaming will be considered or players can share their profiles (including characters/items) across them. The answers were “no” again. Last but not least, the second statement has just been posted a few days ago in the official forums. We hope that this post brings some light into the dark. The question is if it’s really necessary? It’s a nice-to-have option for specific game genres, but could cause a lot of balancing problems, especially in aim-heavy games because of the many different available input devices out there.